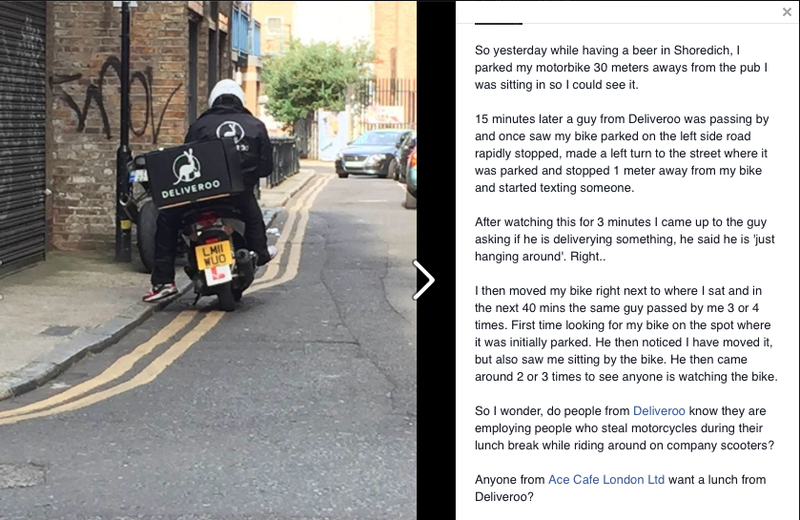 Are takeaway delivery riders planning to steal your bike? It seems like the perfect cover story, takeaway delivery riders slip between the cracks of your vision. Like cab drivers and cyclists, there are so many of them that eventually you just stop seeing them. What better way to scout for bikes to steal than by using a takeaway delivery as an excuse for crawling around town. When a London based Suzuki GSX-R owner locked his bike up near a Shoreditch pub in order to partake in a light refreshment, it didn’t take long for his bike to catch the attention of a scooter riding delivery rider. Check out the post in the image below and you can judge for yourself what happened. The owner of the bike would rather not be named, which we can appreciate. He did say that Deliveroo appeared to be following up his complaint and that he was looking forward to seeing the result of their investigation. He was also keen to point out that other bikers in London replied to his post, saying that they too had seen scooters from the same company acting suspiciously near bike bays in central London. We’ll check back in on this in a few days and see what’s going on. Motorcycle theft in London is a massive problem, on average 27 bikes are stolen every single day. That’s over 9000 bikes a year. If you’re on the receiving end of a bike theft, it might feel like very little is being done about the problem. The City of London Police and the Metropolitan Police have plans to ramp up their operations to combat bike theft, you can read about them here . If you get a minute, you should also read this piece we published last year about what to do if you think you’re being followed by bike thieves.